From marble accents to combining rustic and modern styles, the aesthetic of a Dubai villa should be complimented with contemporary trends that can still be timeless. Whether your style is elegant, modern, sophisticated or classic, these kitchen design trends are all about customising your space to suit you. Who doesn't love the white marble trend?! Marble is quick becoming a timeless feature to add to any kitchen, but recent kitchen trends indicate that the more dramatic the marble, the better! So introduce marble to make a statement with stone countertops that inject character and feature islands like this one from New Evolution. Although monochrome kitchens can still look super sleek and clean, mixing and matching colour palettes and different textures is becoming more popular –as we love the contrasting elements in this kitchen design. This year dark charcoal tones, blue hues and warmer woods are a favourite among homeowners. Rustic finishes like rich wood tones full of warmth and charm are being combined with modern stainless steel, glass tops and styled pendent lighting to create a harmonious blend of styles. Chic and sophisticated, this trend allows you to add your personality into the kitchen and pick different elements that complement each other. Despite the recent trend for natural wood cabinetry, the modern monochrome kitchen remains a design must. Whether you’re designing a kitchen in a smaller space or you want to create a bright and clean space, the all-white kitchen is still the perfect fit. At New Evolution, all cabinets and worktops are manufactured in house with high end finishes using the finest European materials. Kitchen designs are sleek, sophisticated and fresh, creating a new monochrome look. Adding a touch of greenery to any kitchen makes it more inviting –especially in contrast to Dubai’s desert tones, as colour is another kitchen trend to follow. Make room for flowers as a centre piece and house plants that fill an empty space; a Scandinavian design trick is to hand plants where possible, for example light fixtures which double as plant stands and draping shrubbery from cabinets. If you want to be more adventurous than the leafy plant, try brightly coloured cabinets, backsplashes and tiles for more of a statement. Interior design service New Evolution, has put a personal stamp on kitchens across Dubai for 12 years. 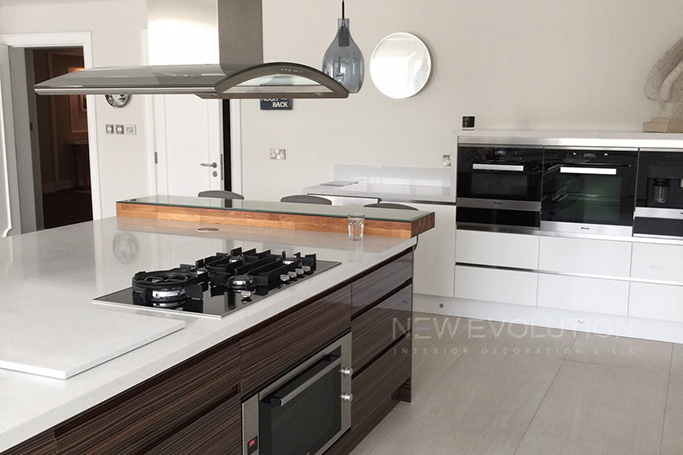 From Palm Jumeirah to Arabian Ranches villas, New Evolution combines creative design with high-quality finishes to produce the kitchen of your dreams. If one of these kitchen design trends caught your eye or you want to create a kitchen that reflects your style, contact New Evolution to discuss ideas!